The thriving German Internet of Things scaleup, SAT4M2M, has joined the EIT Digital Accelerator to benefit from various support, such as preparation for international growth in fast growing markets (Europe, Asia, US) and access to EIT Digital's investor network SAT4M2M's satellite communication network enables a worldwide IoT monitoring of fixed and moving assets in many verticals including transportation (like railways with secure, low-power sensors), energy, agriculture, infrastructure and industry 4.0. SAT4M2M was founded in 2014 in Munich. Its satellite based Low Power Wide Area Network (LPWAN) for IoT communication covers the entire globe (except the North and South Pole). Dr. Martin Haunschild, CEO of SAT4M2M and former coordinator for Aerospace and Navigation for the Bavarian Ministry of Economy, looks forward to the collaboration with the EIT Digital Accelerator team: "The next steps for SAT4M2M will include the further technological development and market growth within Europe, where LPWA is born. By entering the Accelerator program, we will get access to the vast industry network of EIT Digital. This will bring us in touch with companies that have urgent needs to monitor the 2.9 billion objects that need to be connected where terrestrial IoT networks are inexistent today". The underlying technology was developed by space experts having identified a need for global IoT communication. "The market entry strategy was carefully prepared starting with disruptive technical benefits and enriched by very good commercial as financial perspectives" affirms Philippe Moretto, SAT4M2M Chief Marketing Officer. SAT4M2M will be supported within the Digital Infrastructure Action Line of EIT Digital. 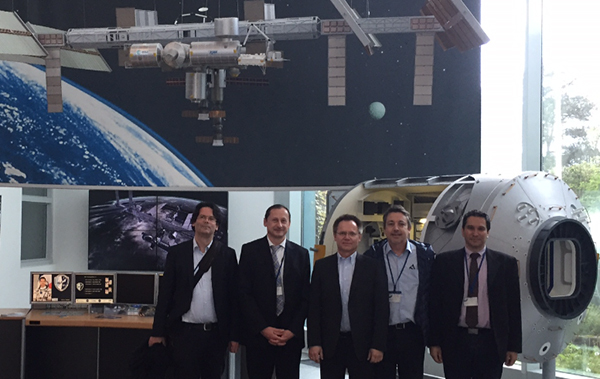 FLTR: Florian Uhlig, EIT Digital A2F Berlin - Daniel Michel, EIT Digital A2F Paris - Marie Caroline Hameon, EIT Digital A2F Paris (not present) - Martin Haunschild, Philippe Moretto, Ilias Christofilos, SAT4M2M at GSOC (German Space Operation Center), Munich. The EIT Digital Accelerator supports European digital technology ventures to scale up in Europe and beyond by helping secure target customers and raise capital. A team of experienced business developers and finance experts operate from 13 cities across Europe as well as from a hub in San Francisco. Since 2012, they have supported more than 240 startups to access new markets and helped them raise more than €80 million in investment to date.